In previous posts about the “knowledge map,” I’ve toyed with the idea of someone being able to follow a blueprint for a suggested order for building knowledge. David Wiley recently announced an open project, in conjunction with Lumen, which might achieve this end: “Open” in the Age of Competency-based Education (iterating toward openness). These continuously improved, openly licensed competency maps will provide much deeper insight into the multiple trajectories from novice to competence in each domain, together with a characterization and ordering of the smaller competencies inside each dimension of competence. As I understand it, this open knowledge map might plot entire domains of objectives/competencies within a given discipline. Perhaps with good metadata for educational resources (for content discovery), we might inch closer to a 21st century curriculum. In digging out of unread/unwatched material for the holidays, I happened across a gem that perfectly describes the idea of the “learning map” which has been a theme in recent posts. 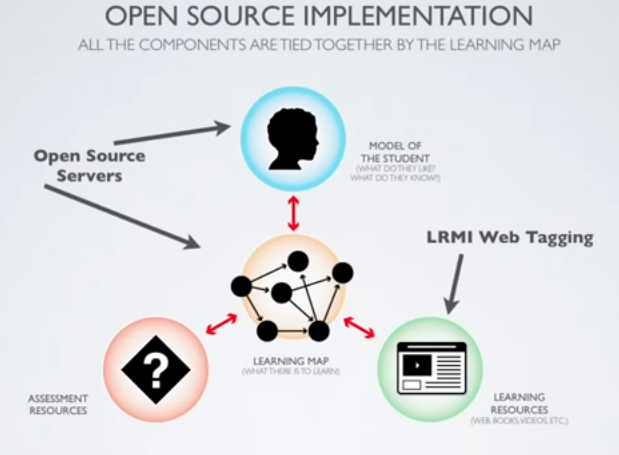 I’d suggest watching all of Danny Hillis’ “The Learning Map” (from OSCON 2012, embedded). In case you can’t devote 15 minutes to watching, Hillis describes a special librarian who steered him towards new interests at a young age (I wish I had a Mrs. Wilner!). He asks the audience what it might be like if everyone could learn whatever they want, and to have a personalized guide to help one chart their learning. Hillis then describes an idea for organizing online materials to help individuals discover relevant and increasingly complex content, and ultimately to assessing their knowledge to guide future learning. Hillis envisions the material laid out in a way that would make sense to a fourth grader — as an actual map, where one could see their way forward as well as past progress (he calls it “a map for my ignorance”). Hillis ends on two topics that are near to my interests — assessment and standards. For example, he points out that assessment might help one who is new to a particular field figure out where to start based on their prior knowledge. In looking at the open source standards to connect the pieces, he notes that LRMI (the Learning Metadata Resource Initiative …not sure how I haven’t blogged about that yet) might provide a framework for organizing existing online material. 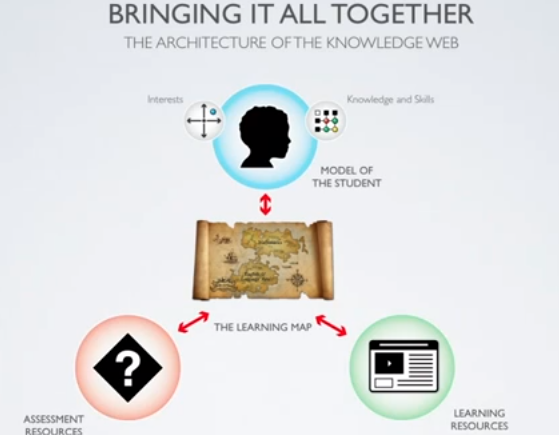 In connecting an organizational strategy for the wide web of educational materials with a means to help one know the depth of their knowledge of a particular area, Hillis provides a path to more holistic learning that one could not gain from taking the occasional MOOC. Perhaps traditional education institutions still have a role to play in the world Hillis describes. There would be much work to do, such as charting the map, creating assessments, and accrediting learning. Maybe a traditional residential education would still be valued for providing an environment where people can connect to walk through the map together. Or, perhaps there are problem solving skills that could not be learned through the knowledge of the map, and the (likely) automated assessments. In any case, this is a vision for online learning that might be worth the decades of investment that it would take to implement. I hope to pick up the thread of standards — especially for assessment — in future posts. What might a Fitbit for learning look like? Wearable technologies for fitness are all the rage. From the Nike Fuel band to the Fitbit, the constant tracking of activity and instant feedback motivates many to gradually increase their fitness. Unless Santa is bringing a surprise, I can’t claim firsthand experience on whether the technology can help people implement the changes they desire, but I wonder if it might be a model for education. While others have postulated what these fitness devices tell us about learning, I wonder if a similar device could be created for mental fitness. Regular, repeated content delivery: distributed practice has been shown to be an effective way to bolster long term retention of newly learned material. Perhaps reminders on a wristwatch (or in something like Google Glass) delivered by an app that knew the optimal content, time, and modality could make routine memorization easier. Connection to real world events: the news can be a great way to find a meaningful connection with the issues of the day. While this is another take on the idea of distributed practice, it’s another way that one might develop the mental frameworks for learning. Mind games: simple recall games, like the ones from Lumosity, might help build build generalized mental fitness — much like wearable physical fitness devices! Other than the difficulties of designing content for exceedingly small screens, I can anticipate one other hurdle to implementing wearable learning fitness technology. The device could not act on it’s own; it would need to connect to another system (or systems) to organize the subjects that one is studying. There’s also the question of whether learning fitness is as marketable as physical fitness. 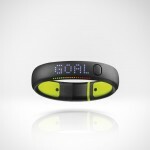 Author johnPosted on December 22, 2013 November 19, 2015 Categories Education, Technology1 Comment on What might a Fitbit for learning look like?